CG Week 2019 will be held on the campus of Portland State University, at the south end of downtown Portland. The conference hotel is the University Place Hotel and Conference Center. A block of rooms has been reserved at the rate of $89 per night, single/double, including breakfast. The room block will be held until May 17; availability is not guaranteed after that date. Rooms may be reserved by calling 1-866-845-4647 or 1-503-221-0140; please mention “SoCG” or “Geometry Conference” when you make your reservation. You may also reserve a room online: go to the web page, select the dates you would like to book, and in the box under enter promotion code type in the code “BOOKNOW”. You will automatically be added to the group for the conference with the conference rate. Given the relatively low cost of the conference hotel, we have not reserved a dormitory alternative to the hotel. For those who want fancier accommodations, there are many national-brand hotels within a 20 minute walk. Here is a link to the Trimet trip planner to help navigate public transportation in Portland. CG Week will use two sets of facilities: SoCG talks will be held in the University Place ballrooms, and CG Week workshops/YRF will be held in Portland State University’s Maseeh College of Engineering, just across the street from University Place . In the Maseeh College we will use classrooms and the five-story atrium (check out the four-story barometer and the drop tube used for zero-G experiments). At least one lunch will be provided, served in the Maseeh College atrium. Other lunches can easily be found in the neighborhood–this is a college campus, and good, inexpensive food abounds. There is a small food cart pod just across the street from the Maseeh College. The banquet will be held at the Crystal Ballroom, 1332 West Burnside, an old-fashioned brewpub that is also a mainstay of the Portland music scene . You can walk there from the conference hotel in half an hour, or you can avoid most of the walking by taking public transit. Higgins, 1239 SW Broadway, 15min walk, $$$: Locally sourced Northwest cuisine, house-made charcuterie. Southpark Seafood, 901 SW Salmon, 20min walk or 15min by public transit, $$: First-rate seafood. Nel Centro, 1408 SW 6th, 12min walk, $$: Pleasant Italian restaurant, lively bar. Chit Chat Cafe, 1907 SW 6th, 7min, $: Student hangout. Don’t get coffee here, but the bubble tea is very tasty. Caffe Umbria, 710 SW Madison St, 15min walk: Very good espresso drinks and pastries. Eleni’s Philoxenia, 112 NW 9th, 20min by streetcar, bus, or Max, $$: A mix of traditional and unexpected Greek dishes. Small plates. Very tasty–one of my favorites. The Pearl District is home to dozens of excellent restaurants; Eleni’s is just one of them. Easily reached by public transit in 20min. Pick a highly rated destination, or just walk around until you find a place that looks good. Keep an eye out for the Unipiper, Portland’s own Darth-Vader-mask-wearing, flaming-bagpipe-playing unicyclist! Don’t forget to stop at Powell’s City of Books, 1005 West Burnside. Papa Haydn, 701 NW 23rd Ave, 35min by streetcar, $$: Superb desserts. The food is very good, but the desserts justify the trek to get here. Paley’s Place, 1204 NW 21st, 30min by streetcar, $$$: Vitaly Paley is one of the stars of Portland’s restaurant scene. Locally sourced Northwest cuisine; delicious! The Northwest 21st/23rd area (home to Papa Haydn and Paley’s Place) is another center of Portland dining and nightlife. It’s not as trendy as the Pearl District, but it has lots of excellent restaurants and a lively street scene, with many sidewalk cafes. 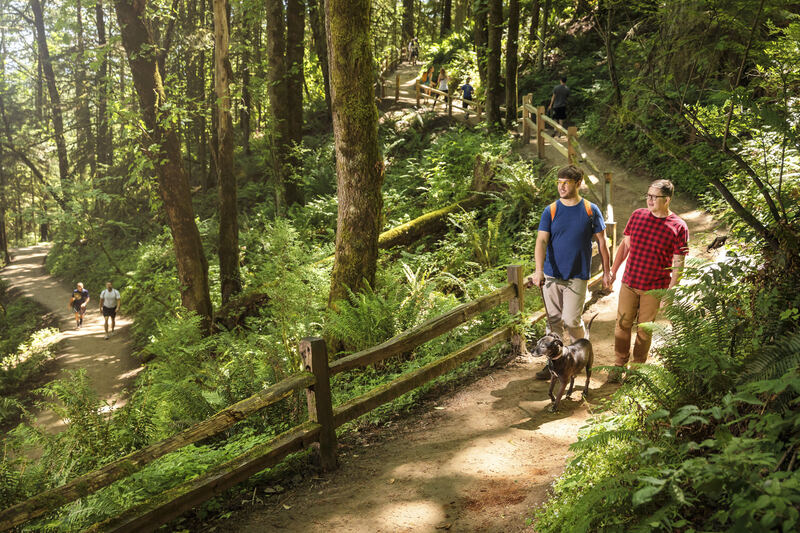 Portland is a delightful city for visitors, with plenty of attractions accessible by foot or public transportation, and many outdoor recreation opportunities within a short distance of the city. Last year the Portland Oregonian newspaper published a series of articles with recommendations for how to spend a week as a tourist in Portland. Here is a link to that series. Visit Powell’s City of Books , a temple to the miracle of the printed word. OK, that may be overselling it. Powell’s is just a bookstore, selling both used and new books, but … what a bookstore! It covers an entire city block, encompasses nine color-coded rooms, and houses around one million books. 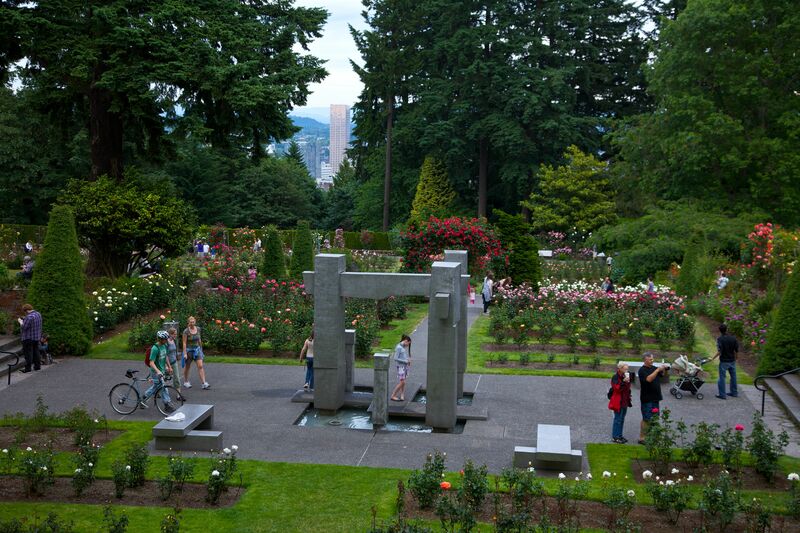 Visit the Rose Garden and Japanese Garden in Washington Park, on the hill above downtown Portland. The Rose Garden, officially the International Rose Test Garden, will be at its most beautiful in June. The view from the Rose Garden over downtown toward Mount Hood is a classic Portland postcard. 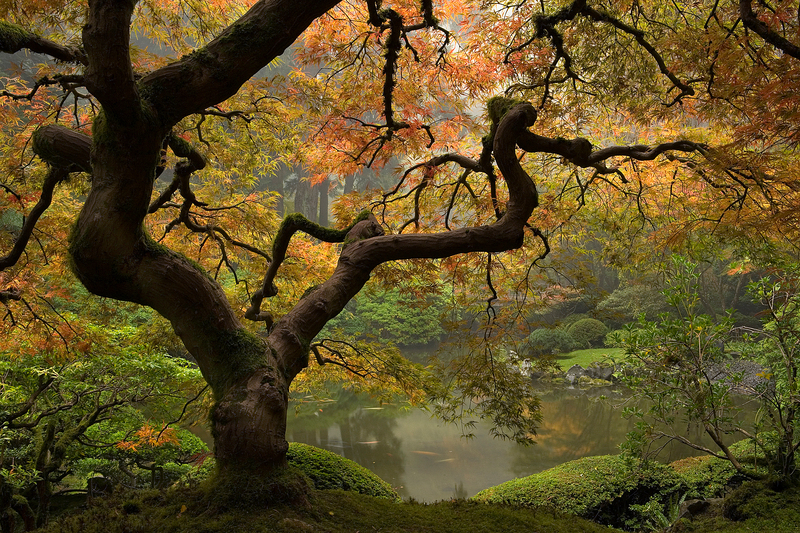 Just uphill from the Rose Garden is the Japanese Garden, a restful, calm oasis. Walk (or run, or bike) along the riverfront. Tom McCall Park lines the river on the west side; the Eastbank Esplanade lies to the east. If you want to make a loop, I recommend the Tilikum Crossing Bridge (carrying public transit, bikes, and pedestrians, but no cars) at the south end of town, and the Steel Bridge at the north end. The 4T Trail is on my list of things still to do, recommended by friends. It is an idiosyncratic exploration of Portland transportation modes. This four-hour loop uses Train (the Max light rail), Trail (a well-marked footpath), Tram (an aerial tram), and Trolley (the Portland Streetcar). You can start the loop by taking the Train (Max) from right in front of University Place, and finish with the Trolley, disembarking just a couple of blocks from the hotel.